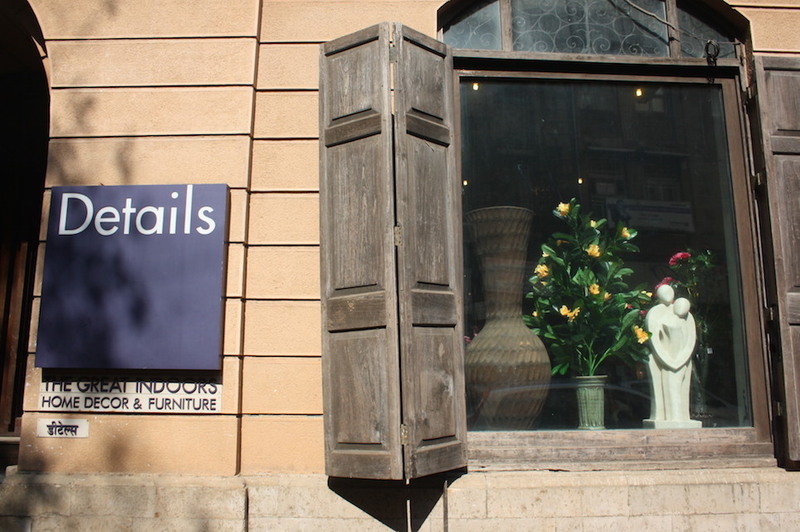 For lovers of old Bombay, who think that the remains of the sepia-toned era are only available at Phillips Images, a walk through the lanes of Kala Ghoda will leave you with a rich sense of culture and a phone full of memories. 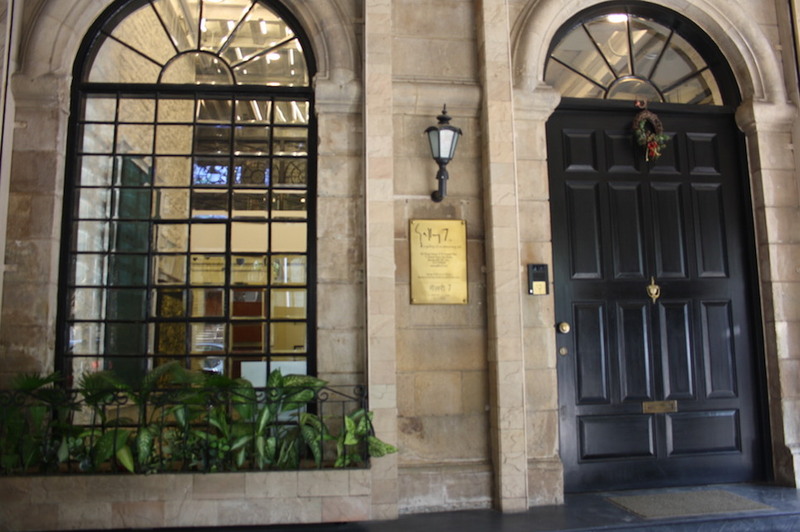 You can still spot Victorian stone buildings, massive wooden doors and specks of gargoyles that are reminiscent of a colonial hangover. You must know: Its curious name meaning ‘black horse’ is taken from a large equestrian statue of King Edward VII (who was also known as Prince of Wales), which was formerly mounted on the crescent-shaped intersection near the famous Jehangir Art Gallery (which is now in Dr Bhau Daji Lal Museum, Byculla). There are some mornings when you wake up and all that’s playing in your head is a sunny number by Colbie Caillat. 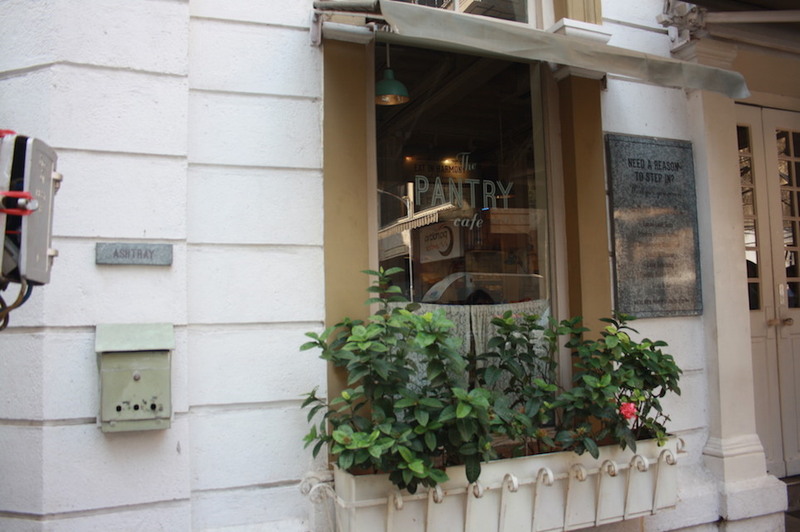 Well, The Pantry is perfect for a carpe diem kind of day with its famous carrot cake and special teas. Trust us, you won’t leave without an Instagrammed picture, and Valencia works best. Just around the corner is the sky blue Keneseth Eliyahoo Synagogue. You must know: this synagogue was built in 1884 by Jacob Sassoon of the Mumbai Sassoon family, who also built the Sassoon Docks.The huge structure is a visual treat with Victorian-styled stained glass windows and rich Burmese teakwood furnishings. 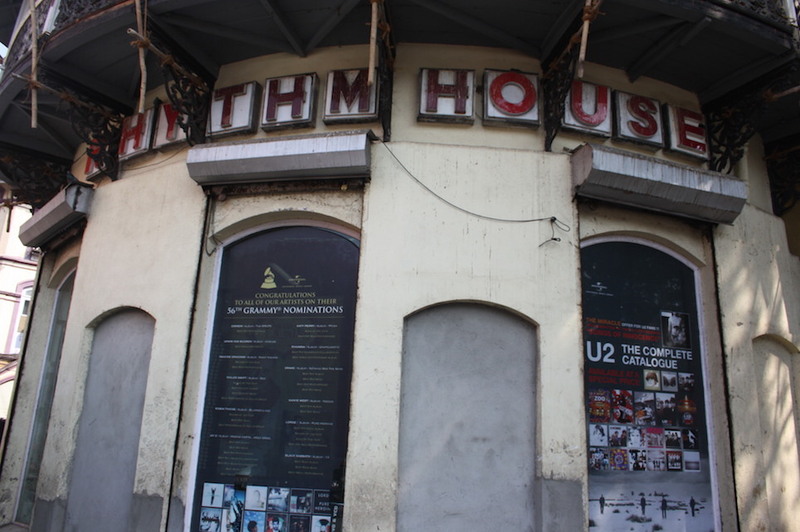 We also found out that this was the synagogue that Madonna visited when she came to Mumbai in 2008. For lovers of Modern art, head to Delhi Art Gallery which is famous for showcasing early Modern art, European artists and 21st century Modern masters. A complete contrast in every possible way, the Artisans’ gallery is firstly a completely different shade, as compared to the all-white galleries in the vicinity. If you’re an ‘India Shining’ person you will definitely appreciate the modern touches to indigenous handicrafts and vernacular art forms. 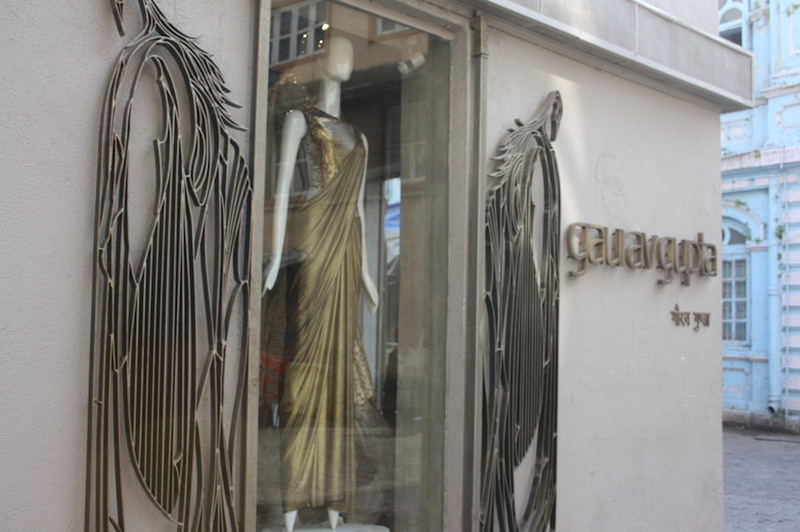 Absolutely unmissable is the Gaurav Gupta boutique with mannequins behind glass windows and wings designed on the outer walls of the store. We’re not kidding when we say it’s fashion taken to the next level. The store has no walls, but sky-high curtains and Greek-inspired murals that make you feel like you’re floating in Wonderland – very much like his shows. 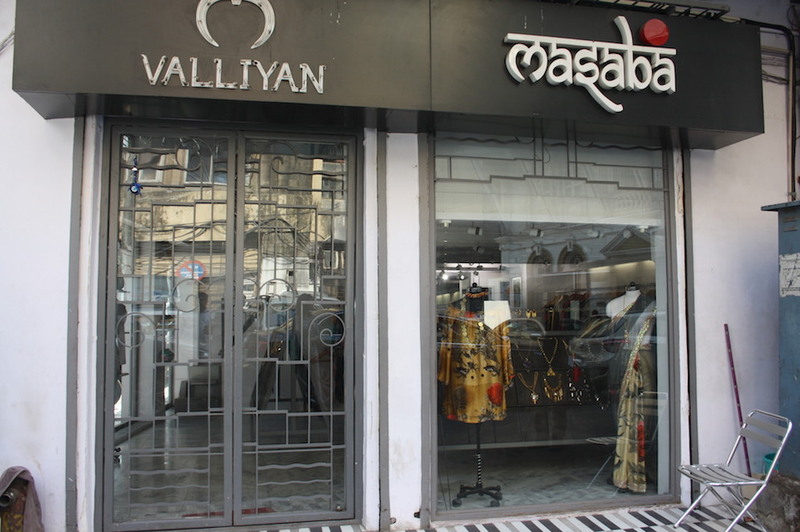 Satisfy your bohemian needs by matching the clothes from Masaba to jewellery pieces from Valliyan. You must see: the art deco-inspired staircase designed by Nitya Arora and quirky chandeliers created by the designer duo. Take a break at the hole-in-the-wall brick café that promises to serve certified organic coffees (you can purchase them too) or their ABC juice if you are a caffeine teetotaller. And while you hang around, don’t miss the well-curated prints that dot the white walls of this arty café. Don’t miss their Rasta sandwich, Akuri and carrot cake. The first left will lead you to Bombay Shirt Company which happens to be one of our favourite places to avail of customised shirts. And, we get them monogrammed with our initials. It’s besides the point that we love the door knobs that resemble shirt buttons. (Learn more about BSC’s founder Akshay Narvekar here.) For lovers of all things art, you will appreciate the Japanese-inspired boutique Obataimu. They stock up on quirky books that make for cool presents. And if you thought this was the works, you can’t miss their made-to-measure service, and the little club of tailors sewing away to glory. If you want a little more of Japanese, stroll into Mamagoto which is famous for its Asian cuisine. Call it kitschy, but we like the psychedelic curtains and Japanese prints surrounding us while we manoeuvre the chop sticks. We hear you can also purchase some of the prints from the restaurant. 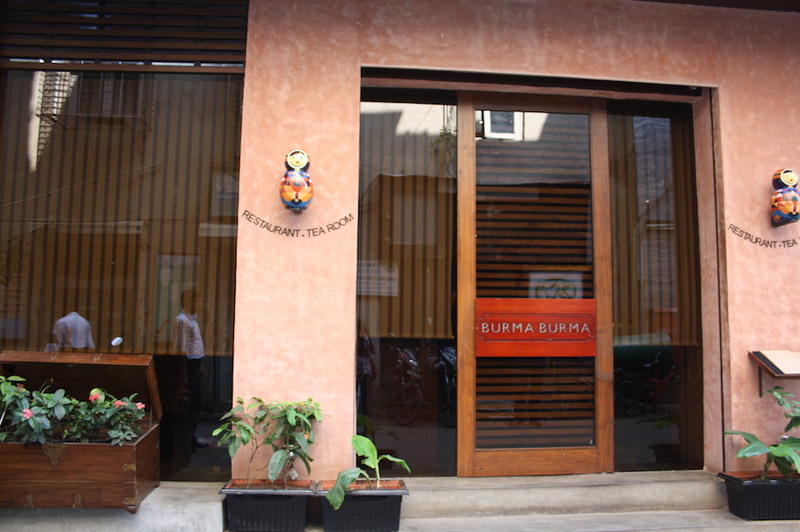 If not that, you could opt to binge at Burma Burma, which will welcome you with multi-coloured umbrellas and of course, pure-vegetarian Burmese food. There’s no moving forward without trying out some art-inspired dessert at the French patisserie, La Folie. Those with a sugar rush should try out their seven-layered candy cake, or the macarons for good luck! (Learn more about pastry chef Sanjana Patel here). You must know: dessert always tastes better when shared. There’s no real reason you need quirky things. You simply have to have them. Filter is a veritable treasure box of quirk. Read: your friends will love you for your presents. Specialty: The crazy chocolate flavours and an odd book or black-and-white photo. If that isn’t your thing, head to the Bargain Book Hut which offers some gobsmacking discounts on books. Cute little room hidden in an old SOBO building; what could possibly stop you from checking this out? 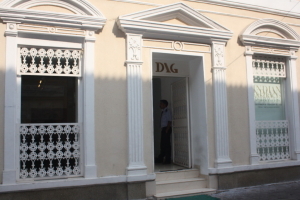 Previously, an art gallery, Hacienda is now a one-stop shop for your wedding cards-attire-jewellery woes. Because one can never resist Amrapali. Because one must adorn the home akin to a lifestyle and housing catalogue and have a Pottery Barn moment like Phoebe did in F.R.I.E.N.D.S. Or you could spend the time adorning yourself. Head to Kitsch for the pick of international brands — we once spotted a Victoria Beckham dress before it became the rage. 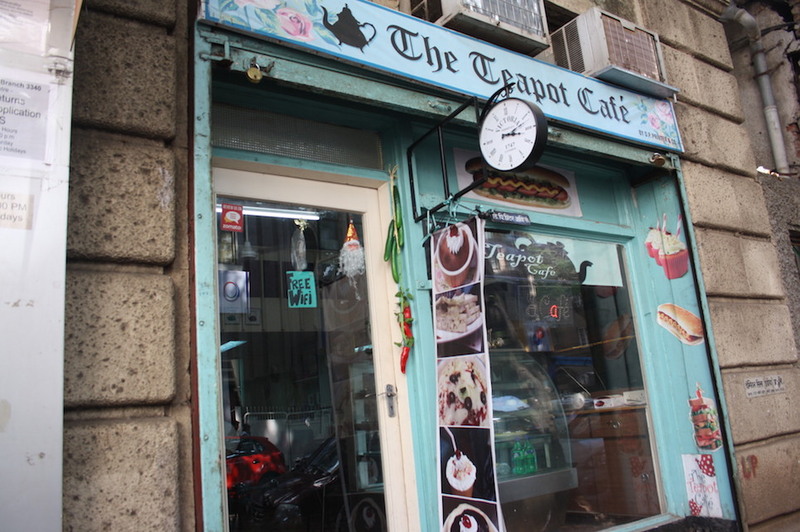 Do a cute little chai number at the The Teapot Café; one of those quaint tea rooms preferred by tourists. The atmosphere screams Goa and the abundant firang sighting validates the same. For something more elaborate, head to The Nutcracker. (See what we thought of The Nutcracker here). Speciality: the softer-than-air buttermilk pancakes and for those who dare, the 7-layered dessert. And the owner’s cute little daughter who merrily offers you a menu. 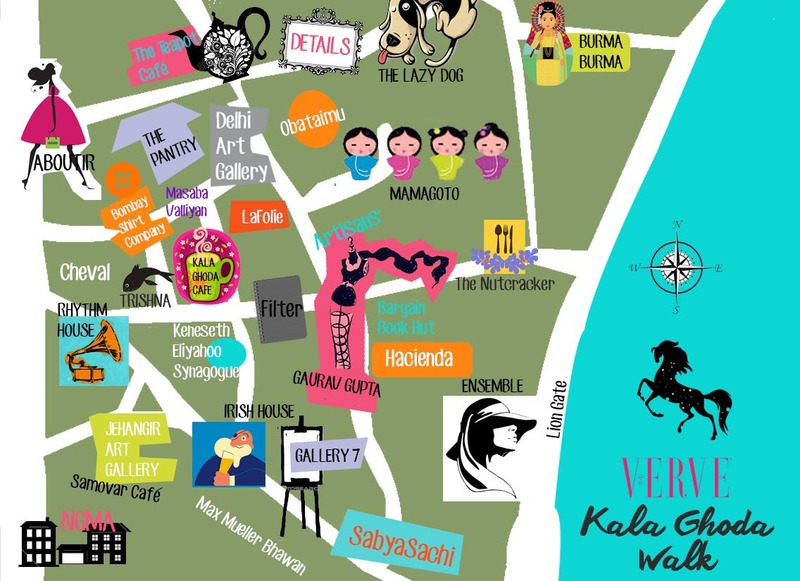 One does not simply go to Kala Ghoda and return without visiting at least one of these art galleries. They are the most iconic art and culture entities of Mumbai. We say gallery-hop and visit all three! 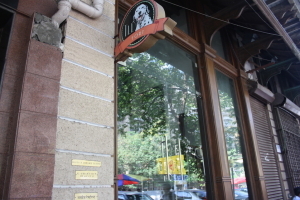 Located inside Jehangir Art Gallery, Samovar Café is a heritage site in itself. 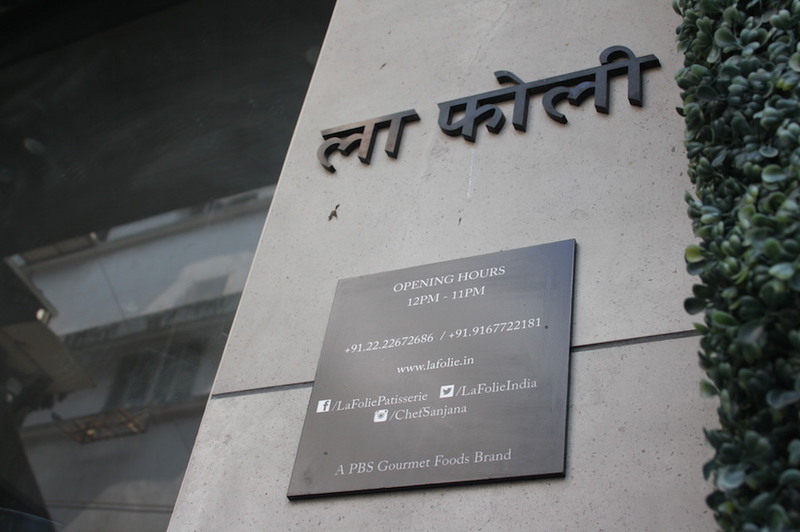 Small, arty and possessing an old-world vibe, Samovar offers some great desi food to boot. It’s Rhythm House! The hemispheric building calls out to all music lovers. How hard-hearted are you to not be a music lover? For all the lowdown on young artists and the joys of mixed media, Gallery 7 hits the sweet spot. 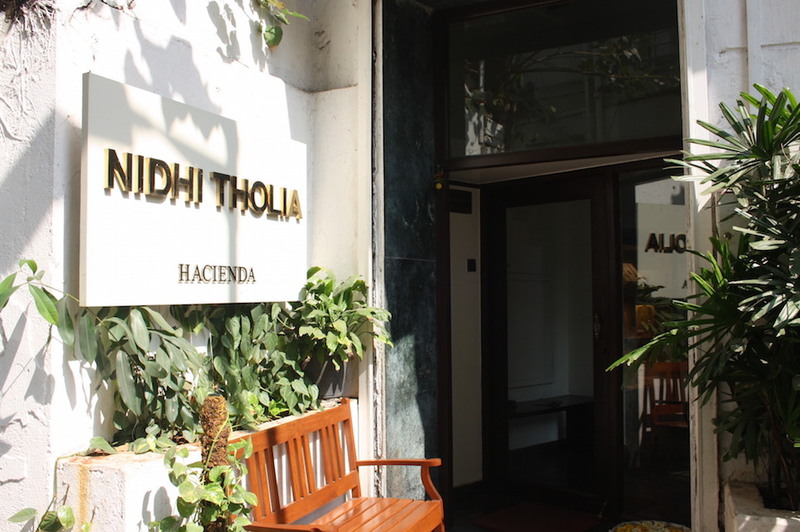 Fingers crossed, and you will hopefully get to meet the gallery owner Chandra Sachdev who is so much art in herself. Chat her up, and in no time you will be sipping on some warm tea listening to first person accounts of MF Hussain and her other contemporaries. 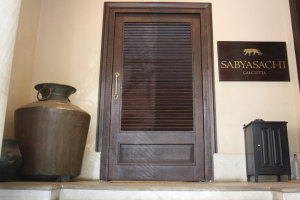 The new Sabyasachi store makes you want to get into bride mode just to enter the beautiful store. (Read what the man says about his beautiful store here). The palatial rooms, lighting and chandeliers promote one to the blissful position of empress because really, why else would you have a grand wedding? If not this, then there’s always Ensemble for your queenly needs. 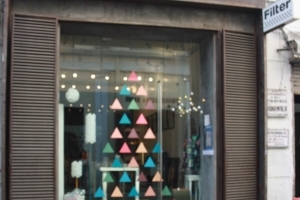 Aboutir could also help you out with the same and a lot else – they offer personal shoppers. Anita Dongre always – always – promises a lovely kitsch outfit or desi trinket that you won’t be able to resist. Here’s to always walking the world like it’s your runway. You can wash away the fatigue of a day out at one of the many bars here. Everyone knows of The Irish House and Cheval but what we really had our eyes on was The Lazy Dog. 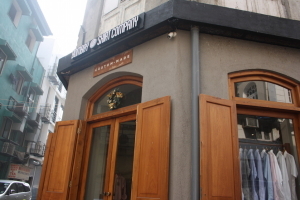 The name complements the place – they open only in the evening. End the day with a medium prawn koliwada at Trishna, the go-to restaurant for seafood. Vegetarians, don’t fret. They make a mean mushroom kadai to serve as a suitable substitute for the aquatic fare. Do you really have room for more?